Over 90 people came out for the opening event of this year's Goldberger Week of Jewish Culture, featuring Dr. Pamela Eisenbaum, Dr. Ira Chernus and Reb Zalman Schacter-Shalomi. A diverse crowd of over 90 people came out on a snowy night for the opening event of this year’s CU Goldberger Week of Jewish Culture, “What Would Spinoza Have Said?”. 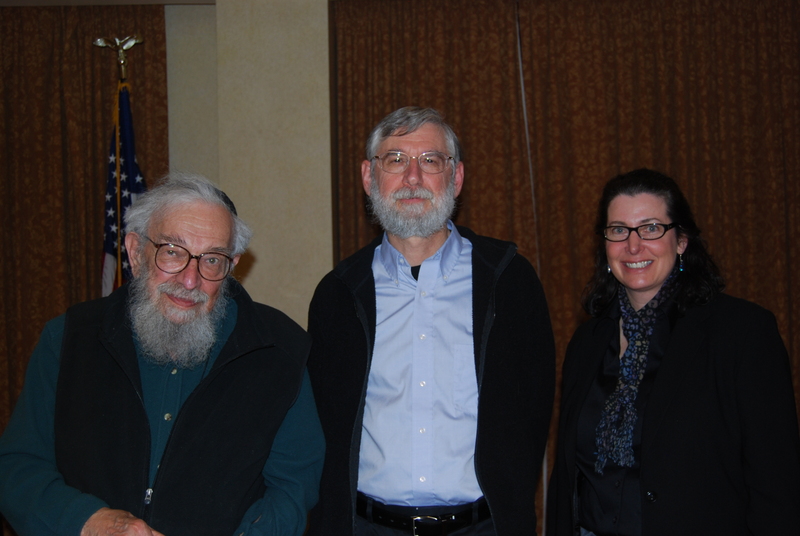 The audience was treated to the stories of three modern-day Jewish MoVeRs (Mavericks, Visionaries and Rebels): Dr. Pamela Eisenbaum, Dr. Ira Chernus and Reb Zalman Schacter-Shalomi. Each had a fascinating story to tell about their journeys to the boundaries of mainstream Judaic thought and practice… and whether they were still, in fact, considered “out there” or whether the mainstream has shifted. The evening was ably moderated by Professor David Shneer, director of the Program in Jewish Studies and associate professor of History at CU. Keying the evening with the 17th century Jewish philospher Baruch Spinoza, whose ideas at the time were so “out there” that they resulted in his ex-communication as a heretic from his Jewish community in Amsterdam, turned out to be a very apt metaphor. Events for Goldberger Week, which include the first Hip Hop Sulha west of Chicago and a performance of From Tel Aviv to Ramallah: A Hip Hop Travelogue of Peace with world renowned beatbox artist Yuri Lane, continue through February 24. Information, tickets and RSVP’s for the entire week of events can be made at www.jewishmovers.org.